The government has stated that the $300-million loan it intends contracting from the CNT Construction Investment Limited (CNCTI) is genuine and would, therefore, pursue it to its logical conclusion. 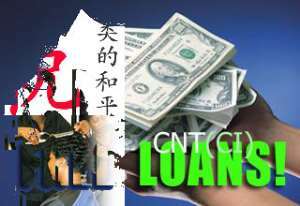 It says the loan is not a scam as is being speculated in certain quarters, but a genuine one which will be given to Ghana by a group of renowned companies forming the CNCTI. The Finance and Economic Planning Minister, Mr Yaw Osafo-Maafo, who said this at a news conference in Accra yesterday, also gave the assurance that the government would carefully exhaust all the necessary steps required of it after Parliament had approved the loan, before finally signing the agreement. Since Parliament ratified the loan agreement a couple of months ago, the media in particular, have taken the matter up by trying to verify the credibility of the source of the loan. Late last month, the Finance Minister indicated at a news conference that he was listening and collating all the views and concerns raised about the deal and would address the issues later. Yesterday's forum, therefore, came as no surprise when the minister was accompanied by the Ministers of Ports, Harbours and Railways, Professor Christopher Ameyaw-Akumfi, Roads and Transport, Dr Richard Anane and Trade, Industry and President's Special Initiatives, Mr Alan Kyerematen, to address the various concerns about the loan. Contrary to earlier reports that the government had already committed itself to the deal by making some upfront payments, the Finance Minister said, “let me clearly inform all Ghanaians that there is no upfront payment in this loan transaction and that fees and commitment charges will be deducted from the loan as it is done in the administration of most credits that I am familiar with”. Mr Osafo-Maafo admitted that there were some initial problems with the address of the company, but these have been corrected, adding that “these happen in financial transactions and are corrected as discussions go on to arrive at a perfect agreement”. He said it is a fact that CNCTI is a consortium of companies incorporated in May, 2003, with the twin objectives of constructing investment projects and providing financial assistance to such projects. Mr Osafo-Maafo said the underlying Memorandum of Understanding (MOU) concluded between the various sector ministers and the lenders in November, 2003, in Accra, were signed by the Chairman of the CNCTI, Mr Li Weizhao and the Vice President of China Railway Construction Corporation (CRCC), Mr He Neng Jin. Mr Osafo-Maafo said the essential element of loan financing is that a credit is given for which repayment must be made over a period, adding that “in this particular financing arrangement, the entity that is providing the facility is the same entity that will execute the project and related services”. He said it was against this background that the President of the CNCTI described the financing arrangement as a suppliers credit. Mr Osafo-Maafo said various loan financing arrangements involving the supply of goods, services and works may be given technical definitions such as hire purchase, suppliers credit, buyer's credit, pre-finance agreement or loan agreement. He said various steps that have been agreed with the Finance Committee of Parliament, include definitive costing of projects and value for money audits for each project before implementation.